Touch ID gives iPad Air 2 and iPad mini 3 users a simple and secure way to unlock iPad with just the touch of a finger, plus the ability to authenticate within apps to better protect logins and data. Touch ID can be used as a secure way to approve purchases from the App Store�nbsp;, iTunes Store® or iBooks Store�nbsp;, and with Apple Pay, when paying for physical goods and services within apps. 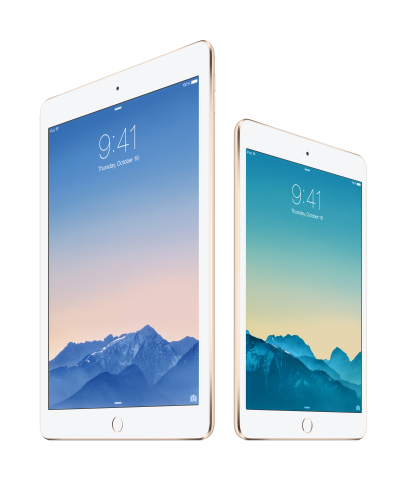 iPad Air 2 and iPad mini 3 come in three gorgeous metallic finishes including gold, silver and space gray, and customers in 29 countries and territories can order online beginning Friday, October 17. Both iPads will be available starting later next week in the US, Australia, Austria, Belgium, Bulgaria, Canada, China (Wi-Fi models only), Czech Republic, Denmark, Finland, France, Germany, Hong Kong, Iceland, Ireland, Italy, Japan, Liechtenstein, Luxembourg, Macau (Wi-Fi models only), Netherlands, New Zealand, Norway, Poland, Portugal, Romania, Singapore, Slovakia, Spain, Sweden, Switzerland and the UK. Availability in Croatia, Greece, Puerto Rico, Russia, Turkey, United Arab Emirates and elsewhere around the world, will continue through the end of October with additional global availability in the coming months. iPads are sold through the Apple Online Store ( www.apple.com ), Apple’s retail stores and through AT&T, Sprint, T-Mobile, Verizon Wireless, additional carriers and select Apple Authorized Resellers.